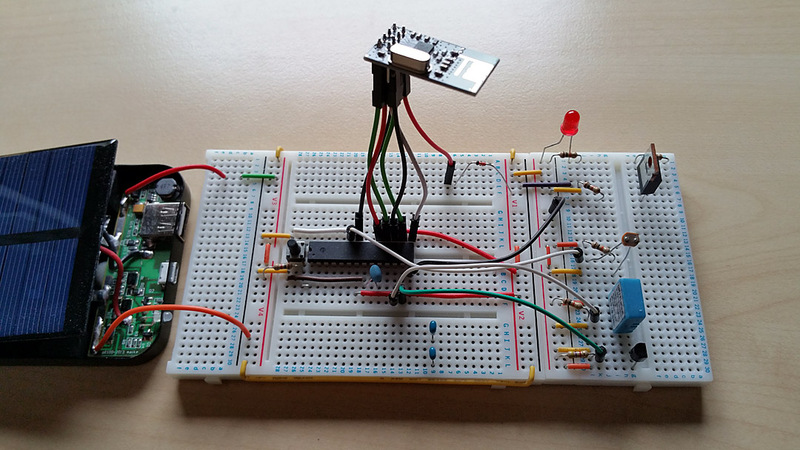 Having this setup on a breadboard I have written a very simple program using Arduino (my goal is to write optimised code in C, but at this stage I just wanted to prove the concept). 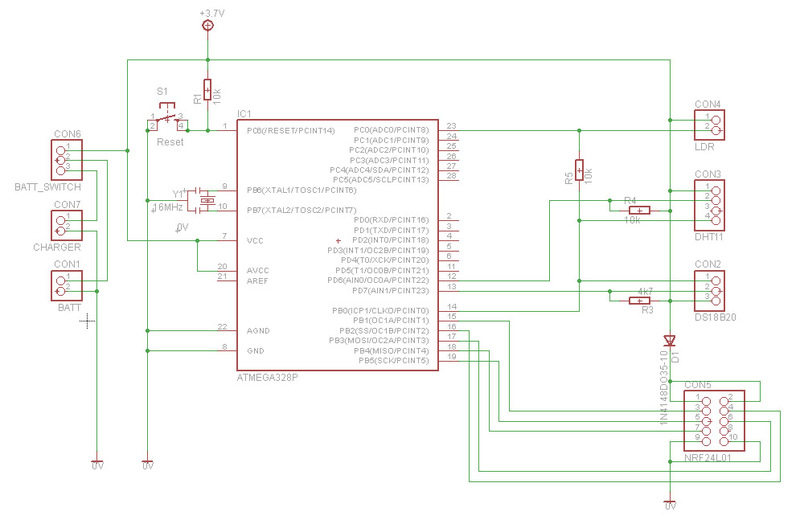 After compilation, Transmitter.ino takes 14kB (15k with serial output) of available 32kB flash in ATmega328P. One thing I don’t like in my program is that I have hardcoded the sensor ID – it means that if I wanted 10 sensors I would need to flash 10 different programs. I think I will add 4 or 5-way dip-switch allowing me to choose one of 15 or 31 addresses (the receiver has ID=0 hence only 15/31 are left for the sensors). I hooked it up to a solar power bank (it has 2600mAh LiPo battery). I have connected the uC directly to the battery (4.1V max. once charged) but I had to add 1N4148 diode before the radio transceiver (it operates at 3.3V). Using a variable PSU I have discovered that everything works fine until 3.1V (minus voltage drop on the diode for the radio), then the DHT11 humidity sensor goes mental (0% humidity) and then at 2.9V the radio stops transmitting (which is good as I’m already getting rubbish readings at this voltage). The solar bank circuit shuts off the step-up converter if there is nothing plugged in to the 5V USB port (which is good in my case as I’m connecting the uC to the battery directly) but the solar circuit works and charges the battery if enough light is provided. The funny thing is that it has a built-in LED indicating charging the battery. It wasn’t of course a problem in a direct sunlight but even then, the LED was consuming more energy than my complete circuit will. The receiver is just another Arduino with NRF24L01+, formatting and forwarding the packet to the serial port. Receiver.ino – 8kB of flash (or 10k with serial output). The next step I’m thinking of is building a second sensor/transmitter and a better, standalone receiver, probably with some LCD displaying the readings. All comments/support appreciated as usual. Follow me on Twitter, Google+, YouTube, Thingiverse or by email to receive the latest updates.